In the past hour a new application has begun spreading on Facebook which has found an exploit in the existing sharing system. Whatever you do, don’t click the link described below. The result is that thousands of users have seen the message spreading to their profiles in the past hour or so. Our guess is that this message could reach hundreds of thousands of users before it’s shut down (unless Facebook’s security team is up right now). The bottom line is this: don’t click any of the links resembling the ones pictured below. Have you seen this spreading on your profile? If your anti-virus software failed to block the intrusion, then you could be spamming your friends with the scammer's message. 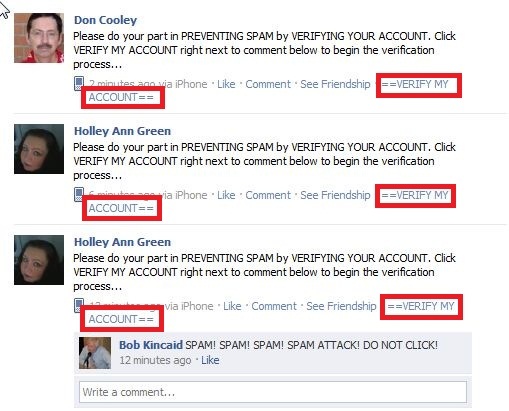 You should clean-up your newsfeed and profile to remove references to the scam. (click the "x" in the top right hand corner of the post). If your installed anti-virus program caught the malware attempt, then your system should not be affected. If you don't have anti-virus software installed, then you need to that immediately and run a full system scan.